July 31, 2009, NORAD (North American Aerospace Defense Command) scrambles F-16 jet fighters after a request was made by the FAA due to an aircraft diverting off course and unresponsive to ATC voice radio communications. On Thursday early in the evening, about 5 PM, pilot and single occupant William Huff, age 61, of Indiana filed a fight plan and departed York, Nebraska in his Cirrus SR22 aircraft enroute to Eagle Creek Airport in Indiana. The pilot was scheduled to land at his destination airport at about 8 PM. Air Traffic Control provided the pilot with enroute weather updates, traffic advisories, vectoring and assigned a cruising altitude of 25,000 feet. At about 7:25 PM the pilot attempted to communicate with ATC, to request a lower altitude as the pilot recognized he was experiencing hypoxia. ATC instructed the pilot to descend to 12,000 feet. However, at this time the hypoxia has taken over and the pilots voice communication became garbled. Air Traffic Control reported they lost voice communication with the pilot and the Cirrus SR22 aircraft, tail number N581DS began to divert off course and did not descend to the assigned altitude. At this time ATC contacted NORAD and informed them of the situation. NORAD scrambled two National Guard F-16 intercept jets base out of Toledo, Ohio. The F-16’s were able to quickly intercept the aircraft. NORAD spokesman, Michael Kucharek reported the F-16’s pilots had shot off flares in the vicinity of the aircraft in order that the F-16 pilots could see in the dark. The pilots noticed that the pilot in the Cirrus SR22 aircraft was slumped over and unconscious. The pilots continued to shoot of fares with the hopes the pilot would awake from the bright lights, the pilot was unresponsive. 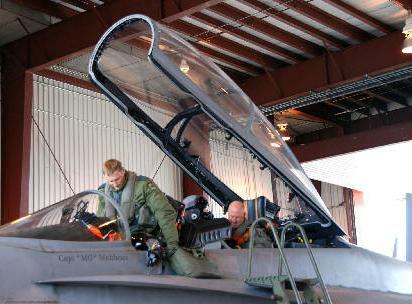 The F-16 pilots noted the Cirrus aircraft was on autopilot. The two F-16 intercept pilots continued to follow the Cirrus SR22 aircraft. However, the jets began running low on fuel. Air Mobility Command sent up a aircraft fueling tanker and each jet was fueled as they followed the Cirrus SR22 aircraft. The Cirrus SR22 aircraft crashed 10 miles northeast of the Jackson County Airport, West Virginia at about 10 PM after running out of gas. The pilot of the aircraft is confirmed dead.